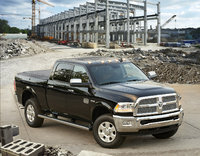 A few changes are expected for the 2014 edition of Ram’s well-wrought 2500 full-size heavy-duty pickup truck lineup. Such changes are expected to be highlighted by a new rear link-coil suspension system with re-worked touring-friendly springs and an available 6.4-liter Hemi V8 powerplant, not to mention a few added tweaks to options offerings. Otherwise, this working man’s hero should retain 3 cab configurations, the 3-seat Regular Cab, the 6-passenger Crew Cab and the extra-roomy 6-passenger Mega Cab. 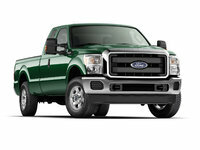 Both the Crew and Mega Cab variations additionally sport 4 independently opening doors. A pair of bed lengths, a standard 6.4-foot and an 8.2-foot long-bed, should also return for 2014, with the Regular and Crew Cabs available with either bed length and the Mega Cab offered with only the standard-length bed. In its never-ending quest to bedazzle consumers with an array of alternatives, the Ram 2500 comes in a variety of trim levels and sub-trims, starting with the base Tradesman and working up to the popularly equipped SLT, the off-road-conquering 4WD-only Power Wagon, the luxury-laden Laramie and the top-tier Laramie Longhorn. Of course, the up-featured Lone Star/Big Horn edition is also slated to return, as is the backwoods-bred Outdoorsman. Of course, all trim levels are delivered with standard rear-wheel drive (RWD), but all can be equipped with available terrain-taming 4-wheel drive (4WD) that boasts auto-locking hubs and, depending on the trim level, manual or electronic hi-lo gear selection. Again for 2014 all Ram 2500s will doubtless come with the standard 5.7-liter Hemi V8 powerplant and 6-speed shiftable automatic transmission. Look for 383 hp and 400 lb-ft of torque from this bad boy, with towing maxed out at 14,350 pounds with the proper equipment. No mileage figures are available, but even with variable valve timing (VVT), don’t expect stellar numbers, efficiency-wise. Should more towing oomph be needed, all Ram 2500 trim levels can be equipped with an available 6.7-liter Cummins turbodiesel inline 6-cylinder (I6) engine that again uses the standard 6-speed shiftable manual transmission to put out 350 hp and 660 lb-ft of torque. An available 6-speed shiftable automatic, meanwhile, boosts this blown diesel’s numbers to 370 hp and a whopping 800 lb-ft of torque. Again, mileage numbers are unavailable, but towing power is topped out at a healthy 18,350 pounds when this brute is properly equipped. Expected to be available for 2014 is a 6.4-liter Hemi V8 gas-burner that’ll flaunt 410 hp and 429 lb-ft of torque under the expected management of the 6-speed shiftable automatic. Though no figures are yet available, look for some impressive towing, and, alas, some not so impressive mileage numbers from this outsized V8. Features-wise, the base Regular-Cab Tradesman is likely to remain pretty bare bones, with 17-inch steel wheels, auxiliary transmission cooling and a trailer hitch and wiring outside, while vinyl upholstery, cruise control, tilt-wheel steering, air conditioning and a 6-speaker AM/FM stereo likely will remain adorning the cabin. Tradesman Crew and Mega Cab variants, meantime, should return sporting a split-folding rear seatback and full power accessories, including heated power-adjustable outside mirrors. A manually sliding rear window, upgraded exterior trim, cloth upholstery, remote power door locks, some added decorative cabin bling, satellite radio and a USB connection should again grace the SLT, while the Crew-Cab-only Power Wagon ought to throw in 17-inch alloy wheels with all-terrain tires, skid plates and a power sliding rear window. The 2014 Ram 2500 Laramie trim level, sold only in Crew and Mega Cab editions, should sport such extras as leather upholstery, heated power-adjustable front seats, a universal remote garage door opener, a rear-view camera, dual-zone climate control, an auto-dimming rear-view mirror, heated steering wheel and memory for driver's settings. The expected Uconnect-interfaced audio system, meanwhile, should remain boasting 10 speakers and a memory-card slot, with Bluetooth hands-free calling once more thrown in for good measure. Finally, the flagship Laramie Longhorn, again available in only Crew and Mega Cab garb, is likely to remain well-equipped with all the adornments of its Laramie sibling, plus step running boards, premium leather upholstery, rear parking sensors and standard hard-drive-based navigation. Optional equipment like a trailer brake controller, single-CD player, auxiliary switches and a spray-in bedliner are again expected to be available to all trim levels, along with power-folding outside mirrors and a tri-fold tonneau cover. Additional available optional equipment like upgraded Uconnect 8.4A with an 8.4-inch touchscreen display, remote engine start, a power sunroof and tubular side steps should return as well, and will doubtless depend on the trim level selected for availability. Safety-wise, look for the 2014 Ram 2500 lineup to flaunt 4-wheel antilock brakes (ABS), traction and stability control, front side-mounted airbags, front and, in 6-passenger editions, rear head airbags, dusk-sensing headlights and a post-collision safety system. The Laramie and Laramie Longhorn, meantime, should return with standard turn-signal-integrated mirrors, while the SLT and above trim levels will likely remain eligible for available rain-sensing wipers and automatic hi/lo-beam headlights. What's your take on the 2014 Ram 2500? 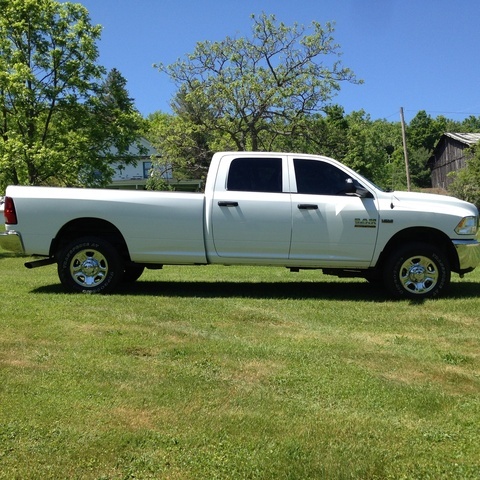 Augie_Angelo I purchased my '14 RAM 2500 to replace a '12 RAM 1500. Went from a 5.7-liter HEMI to a 6.7-liter CUMMINS. Same basic transmission, but the 2500 has a much heavier suspension and towing my 33' travel trailer is a much more enjoyable ride. With the 2500 suspension comes a more "truck-like" ride, but the fuel mileage on the HEMI was just over 15 mpg while the mileage on the CUMMINS is running around 20 mpg. With diesel being an average of $0.30 more, the tradeoff is more economical. The cost-effectiveness will be charged when it comes to maintenance. Diesels requiring more filters, fluids, etc. may make the cost tradeoff a "wash." However, I'm happier with the 2500 than the 1500, so I consider it a win. Hope the next guy is as happy with his as I am with mine. Oh, and by the way, Stanley Dodge in Brownwood, TX is the place to go. They are outstanding to deal with! 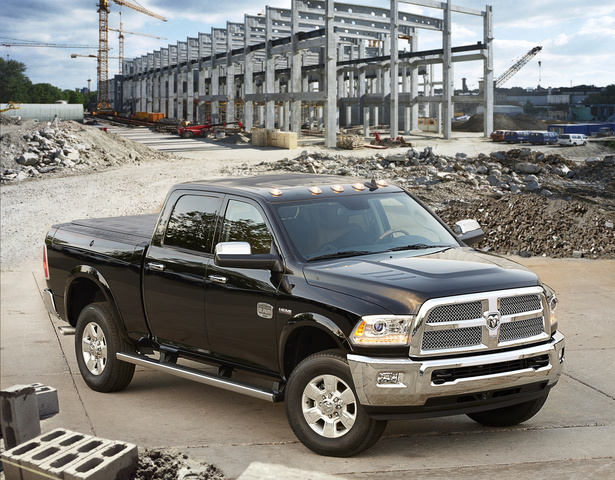 Users ranked 2014 Ram 2500 against other cars which they drove/owned. Each ranking was based on 9 categories. Here is the summary of top rankings. Have you driven a 2014 Ram 2500? How Do I Replace The Front Turn Signal Bulb On A 2014 Dodge Ram 1500? Have a 2014 ram 2500, cummins. Need to replace the turbo. Does the exhaust manifold need to be removed in order to have enough clearance for the turbo to come out?